Whether throwing a ball, paddling a canoe, lifting boxes, or pushing a lawn mower, we rely heavily on our shoulders to perform a number of activities. Normally, the shoulder has a wide range of motion, making it the most mobile joint in the body. Because of this flexibility, however, it is not very stable and is easily injured. The shoulder is made up of two main bones: the end of upper arm bone (humerus) and the shoulder blade (scapula). The end of the humerus is round and fits into a socket in the scapula. Surrounding the shoulder is a bag of muscles and ligaments. Ligaments connect the bones of the shoulders, and tendons connect the bones to surrounding muscle. To keep shoulders healthy and pain-free, it’s important to know how to spot and avoid common injuries. Shoulder instability happens most often in young people and athletes. When muscles and ligaments that hold it together are stretched beyond their normal limits, the shoulder becomes unstable. For younger people, this condition may be a normal part of growth and development. Shoulders often stiffen or tighten with age. In athletes, shoulder instability is caused by certain motions used in tackling or pitching, for example. These motions put great force on the shoulder, stretching the shoulder ligaments over time. It can cause pain that comes on either quickly or over time, a feeling that the shoulder is loose, or a weakness in the arm. Treatment includes rest, physical therapy or surgery. A shoulder separation, or sprain, happens when the ligaments that hold the clavicle to the roof of the shoulder tear. If this happens, the clavicle is pushed out of place and forms a bump at the top of the shoulder. Sprains often happen during a fall, when your hand or arm is outstretched to stop the fall, or when you fall on a hard surface. When the sprain happens, it causes severe pain, a misshapen shoulder, and decreased shoulder movement. Treatment depends on the severity of the sprain. To help decrease pain and swelling, apply ice right after the injury. Keeping the arm in a sling to limit the movement of the shoulder lets ligaments to heal. This is followed by physical therapy exercises. Sometimes, surgery is needed. 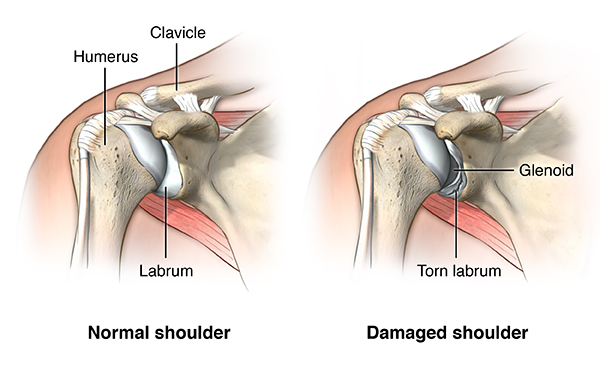 If the ligaments holding the shoulder muscles to bones tear and can’t hold the joint together, the shoulder is dislocated. Falling onto an outstretched hand, arm or the shoulder itself, or a violent twisting, can cause a shoulder dislocation. The main symptom is pain in the shoulder that becomes worse with movement. To treat a dislocation, apply ice right after the injury to decrease pain, swelling and bleeding around the joint. Within 15 to 30 minutes of the injury, the joint will be painful and swollen. A dislocated shoulder needs urgent medical care. Healthcare providers treat dislocations by using gentle traction to pull the shoulder back into place. When the shoulder pops out of the socket repeatedly, it’s called recurrent instability. Recurrent instability can be treated with surgery to repair the torn ligaments. The rotator cuff is a group of four muscles of the upper arm. They allow you to raise and rotate the arm. The muscles are attached to the bones by tendons. The tendons of the rotator cuff allow the muscles to move the arm. If the tendons tear, the humerus can’t move as easily in the socket. This makes it hard to move the arm up or away from the body. As people age and are less active, tendons start to degenerate and lose strength. This weakening can lead to a rotator cuff tear. Most rotator cuff injuries happen to middle-aged or older adults who already have shoulder problems. They can happen in younger people too. The shoulder has a poor blood supply. This makes it harder for the tendons to repair and maintain themselves. Using your arm overhead puts pressure on the rotator cuff tendons. Repetitive movement or stress to these tendons can lead to impingement. This is when the tissue or bone in that area becomes misaligned and rubs or chafes. Treatment depends on the severity of the injury. If the tear is not complete, your healthcare provider may suggest RICE, for Rest, Ice, Compression, and Elevation. Resting the shoulder is probably the most important part of treatment. But, after the pain has eased, you will need to start physical therapy to regain shoulder movement. Your healthcare provider may prescribe a nonsteroidal anti-inflammatory drug (NSAID) for pain. This extreme stiffness in the shoulder can happen at any age. It affects about 2% of Americans, most often between 40 and 60 years of age. But the causes are not fully understood. Frozen shoulder can affect people with diabetes, thyroid disease, heart disease, or Parkinson disease. It can also happen if the shoulder has been immobile for a period of time. It happens when a minor shoulder injury heals with scar tissue that affects how the joint moves. This scar tissue reduces flexibility in the shoulder and makes it more prone to injury. The main symptom is the not being able to move the shoulder in any direction without pain. Treatment can be NSAIDs, cortisone shots, or physical therapy. You can reduce further injury and stiffness by stretching before starting activities. A sudden increase in activity can place great stress on the shoulders and lead to a loss of flexibility. This is a common problem in middle age, especially among people who don’t exercise regularly, but go out every now and then for an intense sport. Although painful and inconvenient, overuse problems can often be treated with rest, NSAIDs and stretching exercises. Starting as early as age 50, some people get osteoarthritis, which causes painful movement. This happens as the smooth surfaces of the cartilage that line the bones of the shoulder joint are worn away, and joints start to wear out and become larger. The most common cause of osteoarthritis is overuse. Treatments for arthritis in the shoulder depend on the severity of pain. The usual treatments are rest, NSAIDs, and cortisone shots. In some cases, a replacement of the shoulder joint is needed. Rotator cuff. Name of a group of muscles and tendons that rotate the shoulder.